A lot has shifted in climate change issues over the last 11 years, but you might not be able to tell by watching former vice president Al Gore's sequel to his 2006 Academy Award-winning "Inconvenient Truth." As one attendee told me after the film's Wednesday night premiere in D.C.: "The film was an unusual combination of electoral self-deprecation and climate narcissism." 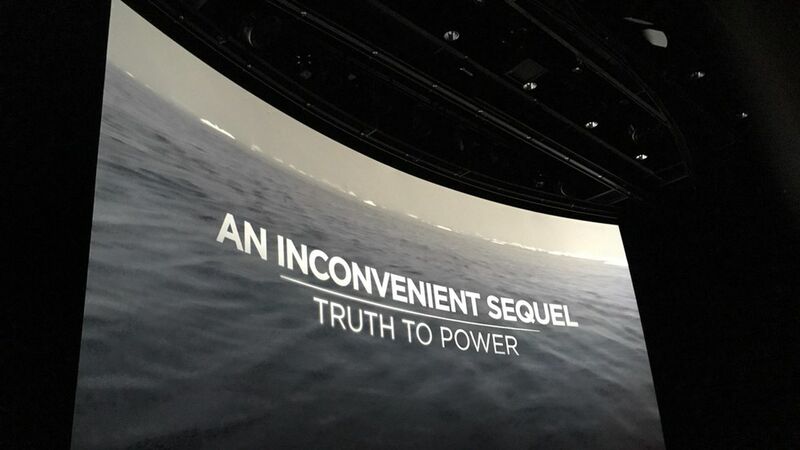 Despite its name ("Inconvenient Sequel: Truth to Power), it's the film that actually ignores the inconvenient reality climate change advocates are now facing with the Trump administration. Instead, we saw mostly more of what we saw in the first film, which is to say: Gore himself and the impacts of climate change (albeit marginally worse). Why it matters: The film, and its Washington premiere, showed how much of the climate movement is out of touch with political reality right now — Republicans control Congress and the White House is run by a president who doesn't acknowledge climate change is real, let alone a problem worthy of addressing. Indeed, the film had a few jokes about how Gore didn't win the presidential election in 2000, and whether he plans to run again for the highest office. ("I'm a recovering politician," Gore says in the film, indicating but not expressly saying no.) Before the film, someone in the audience shouted he should run for president in 2020, Gore replied: "I'll answer that in the movie." One level deeper: Reports surfaced last month that Gore was changing the ending to accommodate Trump's Paris withdrawal, but it was clearly tagged on at the end of a film focused elsewhere, a complaint some attendees made afterward. That's the risk you run with making films whose endings are dictated by real life. It was only in the end credits that the words flashed on the screen that Trump withdrew from the Paris deal, prompting hisses from the audience. Cheerful, if not defiant of the political realities. The who's who of progressive climate politics were there, including House Minority Leader Nancy Pelosi of California and Sen. Sheldon Whitehouse of Rhode Island. In the pre-film reception, attendees noshed on vegetarian fare, like mini watermelon squares with feta cheese. The film will be released nationwide on Aug. 4.